Heading to the salon for a facial treatment is exactly that — a treat — but on a regular basis, we don’t have the time or the cash to spend at the spa. Everyone wants the beautiful, glowing skin that comes with the appointment, but we’re all about finding an at-home treatment. 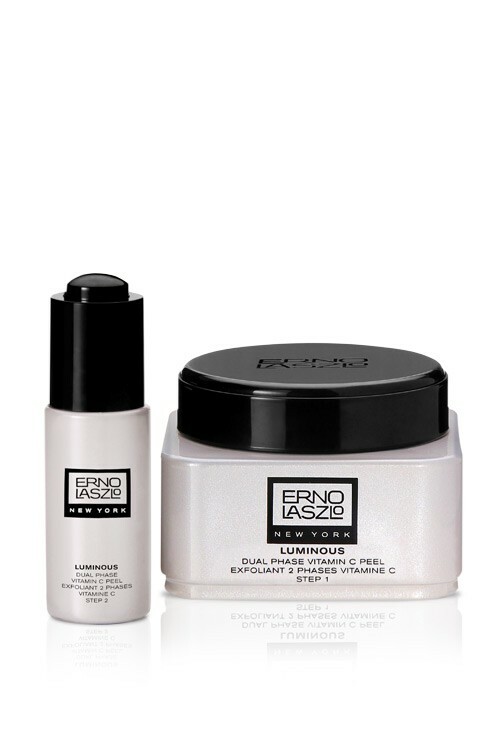 So, when we found Erno Laszlo’s Dual Phase Vitamin C Peel, we forgot all about the spa in favor of getting glowing skin while watching our favorite show on Netflix. Some at-home peels can look a little dangerous, but this two-step process gives you serious quality with complete safety at home. Besides giving you a total glow, using this peel also fights discoloration and brightens, all while reducing fine lines, too! Smooth, exfoliate, and hydrate your skin with this dual phase peel. First, smooth the Step 1 peel all over your face, avoiding the eye area, massaging gently in circular motions for about three minutes. Place 2-3 drops of the Step 2 Activator in your hands, then massage over your entire face, avoiding the eye area. Fair warning: A warming sensation will begin happening and foam will start to appear. Let the peel absorb into your skin for about one minute, then rinse with warm water and apply moisturizer to seal the hydration in your skin.